Scott Styris took two crucial wickets and then struck an unbeaten 87 as New Zealand beat England by six wickets in their Group C encounter in St Lucia. Kevin Pietersen top-scored for England with 60, but Paul Nixon and Liam Plunkett's stand of 71 was crucial after four wickets fell in 21 balls. That took them to 209-7, and the Kiwis fell to 19-3 to give England hope. But Styris and Jacob Oram (63no) shared a fantastic stand of 136 to ease New Zealand home with 54 balls to spare. It was a match-winning display from Styris, who came to the crease in just the second over after a dream start for England to the Black Caps' reply. Fully aware that the target of 210 was probably 30-40 runs short, England skipper Michael Vaughan went on the attack early on and it paid dividends. Why is it that England disappoint when it really matters? James Anderson struck in his first over, drawing an edge from Lou Vincent, and Andrew Flintoff plucked a superb catch at slip to see off Ross Taylor. The Kiwis then fell to 19-3 when captain Stephen Fleming offered a top edge to Ed Joyce in the deep to give Anderson his second wicket. Styris and Craig McMillan responded by going on the attack, but the introduction of Monty Panesar brought immediate dividends when McMillan holed out to Jamie Dalrymple in the deep off only his second ball. However, with such a small total to target, Styris and Oram could afford to take their time and - one smash over the boundary off Panesar from Oram aside - the pair ran ones and twos to frustrate England. It might have been a different story had Vaughan had a slip in place when Anderson drew an edge from Oram on his return to the attack with the Kiwi on 21, or had umpire Asad Rauf given the left-hander out when he edged to slip off his pads from Panesar, but he survived both. Pietersen later dropped what should have been an easy chance when Styris chipped a Panesar delivery to cover and it proved crucial as the pair cruised home with no further scare. The drop was indicative of a sloppy display in the field by England, carrying on from where they had left off with the bat. Vaughan's side got off to the worst possible start after losing a vital toss and being asked to bat, losing opener Joyce to the second ball of the innings. The Middlesex batsman had faced just one delivery - a no ball - before he chased a short wide delivery from James Franklin and edged behind to fall for a duck in the first over and Ian Bell fell in similar fashion to Oram eight overs later. Vaughan showed glimpses of his top form on his way to 26, but he brought about his own demise when he chopped Franklin onto his stumps. That left them on 52-3, but brought Collingwood to the crease and he and Pietersen soon displayed the kind of patience and concentration that had been patently lacking earlier. With Collingwood happy to nudge and nurdle the ones and twos, and Pietersen using his feet to great effect, England were regaining some composure - even when Daniel Vettori's first ball rapped Pietersen on the pads and his lbw appeal was denied. 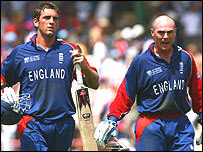 However, after taking England up to 133-3, suddenly disaster struck for the pair. Collingwood, having survived a caught-and-bowled chance two balls earlier, edged Styris behind to spark a collapse, with Pietersen and then Flintoff chipping slow Shane Bond deliveries into the deep and to midwicket respectively. England had no answer to the paceman, who enjoyed a dream start to his World Cup with figures of 2-19 from his 10 overs. Once again, England were reeling and Dalrymple had made just three when he edged behind off another slower Styris delivery. It was left to Nixon and Plunkett to make a mockery of the earlier collapse with some fine shots in the last few overs, sharing a stand of 71 with 47 coming off the last five overs. But it was not enough and England must now rebuild against Canada on Sunday.